uTry.it turns one today! Woohoo! It’s amazing looking back to the past 365 days. 365 days of happy memories because of you, every single one of you, my dear readers and food blog friends. When I wrote my very first blog post a year ago, I’ve never expected I would gain so much from writing a food blog (besides gaining the weights from testing out recipes, hahaha…). I’ve made so many news friends and fellow bloggers. I truly cherish all of your friendship, comments, supports, feedbacks and kindness. It’s overwhelming, but in a very positive way. Did you know, the post that received the most comments and feedbacks in the past year was The Culinary Smackdown Battle-Cookies. It was such a fun event/contest. I really love to see all those scrumptious cookie recipes that you shared on my blog. Maybe I’ll host another similar event again in the near future. What do you think? Speaking of cookies, the French Macaron was the type of cookie that got the most recipe posts in the past year from the cookie category. Probably because it’s a plain canvas that I can create so many different flavor combinations in these little cuties. What can I say, they are absolutely addictive. If you haven’t make these cuties before, here’s the post for some basic Macaron making tips. To extend my appreciation for your supports of my blog, I’m hosting a Giveaway on uTry.it’s Birthday. The prizes from the giveaway will help you to a step closer to making these Macarons as well. That is, if you haven’t make them before. This Giveaway is now Closed. Thank you for everyone who participated. 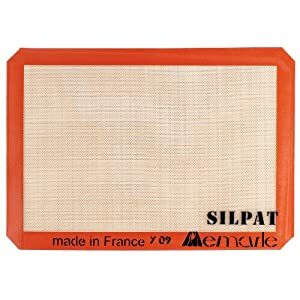 Prize #1: Silpat Non-Stick Silicone Mat 11 1/2-by-16 1/2-inch. It fits perfectly on my 12 by 17-inch baking sheets. A must have for Macaron making. Of course, you can use the Silpat when you make any other cookies, breads, meringues, etc. 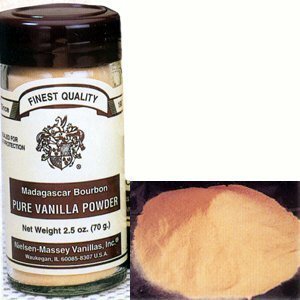 Prize #2: Bourbon Vanilla Powder 2.5 oz. by Nielsen-Massey Vanillas. A key ingredient for Macaron making. Adding lots of flavor but not moisture, which is essential for successful Macaron making. This giveaway is open to anyone, anywhere in the world. 1 winner will be selected using Random.org and the winner will get both prizes. Must be a uTry.it public follower/member through Google Friends Connect to participate. (See the right hand side bar under “Follower” with the button “Join this site”). You have until Wednesday, August 31st, 12 midnight PST to enter this giveaway. Winner will be contact via email shortly after the giveaway is closed. Leave a comment and tell me what kind/type of recipes you would like to see more on my blog. Is it desserts,entrée, or entertaining appetizers? Do you like Chinese, Asian, French, Italian or whatever you can think of? 1) “Like” uTry.it’s Facebook page. Here’s the link. 2) Share this giveaway with your friends on Facebook. Please include the link to this post when you share. 4) Tweet about this giveaway. Please include my Twitter handle @utry_it and the link to this post in your tweet. 5) Subscribe to my blog via email. You’ll receive an email to verify the subscription. 6) Subscribe via RSS feed. In a stand mixer fitted with the whisk attachment, whip the egg whites to a foam, gradually add the sugar until you obtain a glossy meringue. Then, add the lemon zest and vanilla powder until well combined. In a food processor, process the almonds and powdered sugar until the almonds are fine. Pour into a large mixing bowl and whisk to break any lumps. Add the meringue into the almond mixture and fold carefully until you obtain a batter that flows like magma or a thick ribbon. The whole folding process should be around 40 to 50 strokes. Test a small amount on a plate. If the tops flattens on its own after 10 seconds, you are good to go. If there is a small beak, give the batter a couple more turns. Fill a pastry bag fitted with a large plain tip with the batter and pipe small round (about 1.5 inches) onto baking sheets lined with a Silpat. Let the macarons sit out for an hour to harden their shells a bit. Preheat the oven to 280F and bake for 15-20 minutes, depending on their size. Let cool completely. In a large heatproof bowl over a saucepan of simmering water, whisk the sugar and egg whites constantly until it feels hot to the touch, about 3 minutes. The sugar should be dissolved, and the mixture will look like marshmallow cream. Switch to the paddle attachment and add the butter, one tablespoon at a time, beating until smooth. Once all the butter is in, add the vanilla extract, lemon zest, lemon juice, and blueberry jam, beat the buttercream on medium-high speed until it is thick and very smooth, about 6-10 minutes. Transfer to a pastry bag fitted with a medium plain tip. For the Meyer Lemon Curd, please see recipe here. Spoon a dollop of Meyer lemon curd in the middle of a Macaron shell, pipe blueberry buttercream around the lemon curd and top with another Macaron shell. Enjoy. I love all your posts, but I would like to see more Asian recipes...and I'm a GFC follower. I'll share this on my FB page. Shared this post on FB. And of course I must comment on your macarons... JUST BEAUTIFUL Must be the prettiest cookie EVER! Great post, and wow, great giveaway. I love my silpats, and certainly wouldn't complain if I got to add another to my collection! I love all your posts, but keep the sweets coming! My goodness what a year you have had. You are a very talented person that I admire so much. I am honored to call you one of my blogger friends. Thanks for all the wonderful work that you share with us! What a great giveaway! I love desserts! Congrats on your anniversary! A year of blogging goes so fast! Happy birthday to your blog! I would love to see more dessert recipes! I always get excited about "mini" versions of things. Congratulations on one year! I am just getting started and look forward to making it to this milestone. I like healthy recipes that aren't too complicated. Amy, what a pretty blog; thank you for inviting me! Congratulations on one year, and I hope you have many more. I am just getting familiar with your blog, but just glancing at some of your past posts, I would love to see more Asian inspired dishes, and I was touched to see your virtual bake sale. The culinary smack-down looks like fun too! You have a lovely blog here! Happy blog birthday to you! I love Asian food so I'm going to have to encourage you to post more recipes for those types of dishes! more desserts or steamed desserts would be awesome! (((AMY))) Congrats on the blogoversary! The Culinary Smackdown Battle was so much fun for me as well. Wonder who is hosting this month? I am happy to be a FOLLOWER of yours and this is an incredible giveaway. As for what I'd love to see more of on your blog... anything with avocados or bacon. Haha! Love everything that comes out of your kitchen. I already receive email notifications. Congratulations on your 1 year blog anniversary! Thank you for visiting my blog. I am your newest gfc follower :) I love your macarons! I have never made a macaron but I do want to! You asked what we would like to see more of on your blog? I think your blog has the perfect mix, but of course I am partial to desserts from anywhere. I'm a follower :) Also, I'd love to see more Chinese recipes...yum! Congrats on your first year! I'm a new follower. Happy Birthday to your blog! I already Like your page on Facebook. Happy Blogiversary! Since you're a fellow "have more lemons that you could ever use" gal, I'd love to see more lemon recipes of all kinds - apps, main dish & dessert. I loved the Meyer Lemon Cake! I'm following you on Twitter now, too! I love the desserts you post--they always look great. These macarons are no exception. Beautiful! I'd like to also see more appetizers. What a beautiful blog! I'm so glad you stopped buy and commented at Everyday art. We're your newest followers... this is my first time visiting and I've already seen so many recipes I want to try. Thanks! Congrats on 1 year! Love your blog -- so many great photos and yummy food! I'm partial to desserts! Congrats on your blogiversary! Hi Amy, I'd love to see more Asian recipes (but I love to make macarons and I love seeing what you do with yours too). Hi Amy, I'd love to see more Asian recipes. I have been a follower fro some time now and love your blog. I also read your blog via google reader. I always love seeing desserts. Of course, I also have a place in my heart for yummy Asian food. I am a follower! Happy Blogiversary! Wow they look delectable. this is my fisrt visit here as I am fairly new to blogging. i must sy in the short time i have been blogging i have made so many wonderful friends and have gotten so much joy out of interacting with likeminded people who are increadiably generous! Happy one-year blogiversary! Your macarons sound so good! Happy Anniversary Amy! You don't have any chicken recipes so that's what I'd like to see. I'm a follower :). I really enjoy your blog. Keep up the great work! I also like you on Facebook under everyday sisters"
I love your blog, love desserts and will try to make the macaroons if I win the Silpat and the vanilla stuff...would love more main entrees with a Thai influence if you could accomodate the request, happy anniversary.. Thanks for stopping by The Freshman Cook and letting me know about your giveaway. Happy Blogiversary!!! I think your blog is wonderful and you have the most gorgeous pictures and delicious recipes. My favorite type of food is definitely southwestern because I love all the spices and flavors, and appetizers of any type are what I love to make (and eat) most. I hope you stop by and see me again. I am a new follower. Thanks. Happy Anniversary. We love your blog and especially all the cookies you bake! Great recipes. Congratulations to your blog's first b-day :) The first post I read on your blog were your delicious butter cookies and I started folliwing you immediately! You're so talented baker and I simply love reading your posts and recipes! A huge congrats one your 1 year blog anniversary! Your macs are gorgeous and what a fun flavor! After seeing your chocolate crepe hazelnut cream cake, I want to see some more beautiful desserts! Wow, what a kind person you are offering this to your international readers! I am so happy I found your blog and I am a new follower! I can see that you look like an expert on macarons-I can't wait to see your ideas and recipes! Best wishes and congratulations on your blogiversary! I just came back to let you know that I am now following you on Twitter and I re-tweeted about your give away. Thanks again! Congrats on one year! Your blog is wonderful and I have really enjoyed being a follower! I'd like to see more vegetable dishes. happy one year blogoversary amy!!!! It's been a sheer delight following you and being blessed by your talents and creativity. keep shining sweet bella! I have never made macaroons, but would love to try! I am a sucker for macarons. But I'm lazy -- and mostly just buy them. LOL Yours look so beautiful, especially with that eye-popping filling. Your macarons not only look great, I bet with the interesting filling, they must be addictive too. I'm a GFC follower who would love to see more Asian recipes. I love Asian food but I'm always a bit intimidated to try it at home! I've just shared your giveaway via my Facebook page. I love your blog (and your gorgeous macarons) so I'm happy to recommend it to friends! Happy Anniversary! I just subscribed to your RSS feed - now I'll really be able to keep track of all your lovely posts ;) Sadly, I'm not on Twitter yet, but maybe someday I'll catch up with the rest of the world! We love love love your blog. Congrats on one year! This recipe looks wonderful and we would love to win the contest! I just found your blog through Foodie Friday! I am now a follower! I've been a follower for awhile now and so glad I found you! You make some wonderful dishes. I'd love more info about making 'easy' Asian dishes ~ I think Thai food is my favorite. Thanks for the opportunity to win ~ love all the items! Happy 1 year blogiversary! Thank you for a great giveaway too. Congratulations on your 1st year of blogging. What captures me when visiting your blog are your wonderful desserts and photo's. I've been following for a while and always enjoy reading your posts! Congrats on the year! And those look amazing, love your photos! :) Happy to have found your beautiful site. Visiting from Friday Potluck! I would love it if you stopped by my blog to say hi! I would love to see more desserts! I liked uTry.it on FB! I followed @uTry_it on twitter! I love all your recipes! I like a good mix so I can see new things that I normally wouldn't make and try them. Thanks for the giveaway! I just love your Macaroons and wish I had a few in front of me right now. Hope you are having a great week end and thank you so much for sharing with Full Plate Thursday. What would I like to see more of? Well this is my first visit via Foodie Friday but I will have to say that I adore a great pie and I make a killer Apple pie. Recipe on my blog in the archives. Girl, I am liking you on FB. I have also subscribed via email. I would so love to win. Thanks. Congratulations on turning one. That is awesome. I am now following your blog on Google Friends Connect, and I would love to see any Chinese or Asian Entrees. That is an area I would like to learn more about. I am also following you on twitter. I would love for a follow back. @kitchenandkids. Congratulations on your blog success! I love reading all your recipes, keep up the great work! !